With a slight change in the starting lineup, coach Fizdale replaced Trey Burke with Emmanuel Mudiay at the point guard position. However, the spotlight player was Noah Vonleh, who in spite of playing only 13 minutes, finished in double-double with 10 points and 11 boards, helping the Knicks winning their 3rd game of the preseason, 106-100 over the New Orleans Pelicans. Vonleh, 23, who sparked the Garden in his home debut with a couple of monster dunks at the right time, said that defense is the key to the great preseason start. Mudiay, on the other hand, struggled in his first two games and in spite of that, he was moved in the starting lineup last night. He worked hard during the summer, lost weight to the point that Scott Perry stated that he’s in “elite shape” but last night he didn’t show any flashes of what’s expected from him, finishing with just a couple of points and 6 assists in 22 minutes. David Fizdale’s roster is packed with quite a few young players – a dozen of them being under 25 – and his role is to try to develop them the right way. Kevin Knox, once again, finished in double-double with 12 buckets and 10 rebounds but struggled with the shooting. In the first quarter he went 1-3, in the second 1-5 and 1-6 in the fourth. He added nonetheless two steals to his stats. 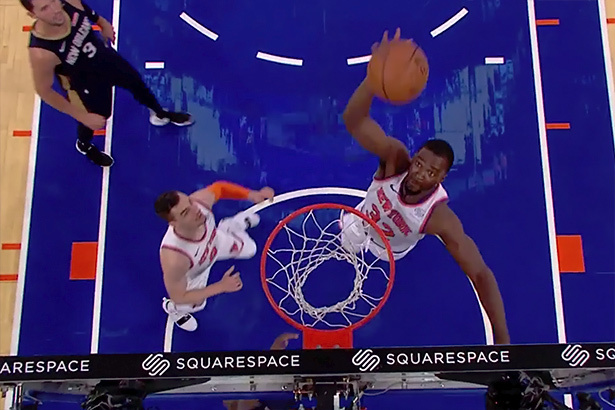 The game started slower for the Knicks, who trailed by single digits early in the game but they regrouped and stole the show with the second quarter to take the lead. After halftime they went on a 15-2 run and built a 15 point lead. The Pelicans (0-3), led by Nikola Mirotic with 19 points and 13 rebounds, fought back in the last act and attempted a comeback, cutting the lead to just 4 points with under 5 minutes on the clock. Their momentum faded after a couple of made baskets by Knox and Isiah Hicks. Tim Hardaway Jr. led the Knicks with 23 points, Enes Kanter added 20 and collected 15 boards and Lance Thomas scored 13. The Knicks – currently the only team with 3 and 0 – will continue their preseason adventure on Monday night when they will host the Washington Wizards (1-1).